Why investors can expect continued market-beating growth from the home improvement retailer. Fiscal 2017 has been good for Home Depot (NYSE:HD) -- and its shareholders. Sales are on pace to rise by over 6% even though management initially targeted just a 4.6% increase. Earnings should improve by 14% to trounce the company's original 10.5% goal. These numbers help explain why Home Depot's stock is one of the best-performing members of the Dow today. The 28% spike year to date has also left rival Lowe's (NYSE:LOW) far behind. The home improvement titan won't release its official 2018 guidance until it posts fourth-quarter results in late February. However, investors have every reason to expect fresh operating and financial records through the coming year. Hurricane and earthquake rebuilding efforts across parts of Mexico and the United States helped Home Depot post its strongest growth pace in years in the third quarter. Its 7.6% comparable-store sales gain marked an acceleration over the prior quarter's healthy 6.3% spike. It was also well ahead of Lowe's 5.7% increase. The boost from natural disasters is temporary but should lift Home Depot's results well into 2018. In fact, executives expect to see elevated demand in the affected areas at least through the first half of the new year. And considering that Home Depot raised its 2017 comps forecast to 6.5% while Lowe's left its 3.5% outlook in place, the company is entering 2018 with healthy -- and growing -- market share momentum as it crosses $100 billion in annual sales for the first time. Home Depot has already passed its goal of 14.5% operating margin, compared to Lowe's 10%. Meanwhile, thanks to smart capital allocation, including restrained store expansion spending, its return on invested capital has already crossed 30%, or about double its peer's result. Of course, Home Depot's results will depend on the health of the home improvement market. And since that cyclical industry has expanded for nearly a decade now, investors are understandably worried that the next downturn might be close at hand. Executives don't see it that way. While home prices have recovered sharply, after all, they're still below the 2007 peak. At the same time, a large proportion of the nation's housing stock is 40 years old or older and in growing need of capital investment. Finally, the rate of new household formation has trailed the long-term average since the housing crises, which should lift demand at least over the next few years. Altogether, CEO Craig Menear and his management team believe these trends should support growth in the housing market beyond 2018 and perhaps for several additional years. Considering the retailer's industry dominance and market-leading financial strength, it's likely the company will deliver solid returns for investors if that prediction pans out -- even following the latest stock price rally. If you're looking for a cheaper option in the industry, then Lowe's is the obvious choice. 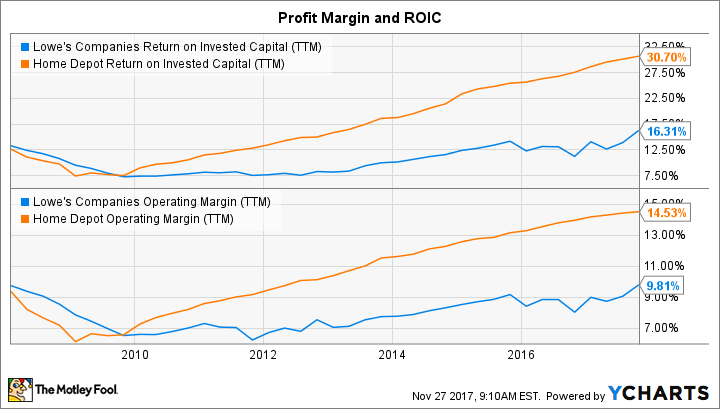 However, Home Depot has a habit of earning its premium valuation by setting aggressive annual sales and profit goals, and then beating them by a healthy margin.